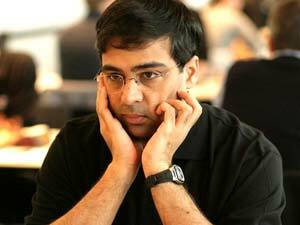 They might not enjoy the same levels of adulation, but in the world of chess India's Viswanathan Anand is every bit as accomplished as fellow countryman Sachin Tendulkar is at cricket. Both Anand, 42, and Tendulkar, 39, rose to the top of their game while teenagers and have stayed at the highest level for decades, lauded by their fellow players at home and abroad for their talent and polite charm. And while Tendulkar, one of the finest cricketers ever to play the game, is worshipped by millions of adoring fans and often considered India's top international competitor, some suggest Anand's record is actually superior. "Anand is, quite simply, the greatest sportsman India has ever produced," declares the website of the Olympic Gold Quest, a foundation started in 2001 to support the country's world-class stars. Anand, the undisputed world chess champion since 2007, embarks Friday on one of the biggest tests of his career as he defends his crown against Israeli Boris Gelfand in the $2.5 million series in Moscow. Dubbed the "lightning kid" for his ability to make quick moves, he has been in a hurry all his life. He became an international master at 15, was crowned Indian champion at 16, won the world junior title at 17 and became the country's first grandmaster at 18. The Tamil Nadu-born wizard, who lives in Spain with wife Aruna and one-year-old son, is seen as a star not only of today's game but of all time. "I always considered him to be a colossal talent, one of the greatest in the whole history of chess," said Russian grandmaster Vladimir Kramnik, who lost to Anand in the 2008 world final. "Each champion has had some sort of speciality, and his is creating counterplay in any position out of absolutely nowhere." Anand will just be the younger man in the clash against Gelfand, 43, but his former opponent Kramnik last August wondered aloud whether Anand still had the hunger of his past. "His main weakness is that he's no longer so young, and now he's also got a child," Kramnik said in an interview. "But at the given moment I think he's the best in the world."